Left, PreSpecialty students Mary Enriquez, BS’17, and Holly Kosir, BA’13, both enrolled in Vanderbilt’s Master of Science in Nursing program after earning Vanderbilt undergraduate degrees. The school’s MSN program is ranked No. 14 in the United States. Photo by John Russell. 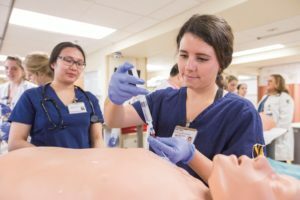 Vanderbilt University School of Nursing has again been named one of the nation’s “Best Graduate Schools” in the annual U.S. News & World Report rankings. The school’s Master of Nursing Science program moved up to No. 14 from No. 15 and its Doctor of Nursing Practice program continued as the No. 11-ranked DNP in the United States. Additionally, six of VUSN’s specialties were ranked. All six of them were named to the nation’s Top 10. The school’s Adult-Gerontology Acute Care Nurse Practitioner and Psychiatric-Mental Health Nurse Practitioner specialties were ranked the No. 2. The Adult–Gerontology Primary Care Nurse Practitioner specialty rose to No. 3 from No. 7, tied with Duke University and Johns Hopkins University. Informatics rose to No. 3 from No. 4; Family Nurse Practitioner rose to No. 5 from No. 6; and Pediatric Primary Care Nurse Practitioner was ranked at No. 8. Dean Linda D. Norman, DSN, FAAN, the Valere Potter Menefee Professor of Nursing, said that while the rankings are gratifying, they reflect only a small portion of the School of Nursing’s impact. “A strong indicator of VUSN’s true value comes every May, August and December, when our students finish their programs and take their places as practice-ready professionals or nurse scholars focused on making a difference in health care and for patients everywhere,” she said. The U.S. News & World Report data comes from statistical surveys sent to administrators of 552 accredited schools of nursing which offer master’s or doctoral programs. Specialty program rankings are based on assessments by nursing school deans and deans of graduate studies who identify up to 10 schools offering the best programs in each specialty area. The surveys and assessments were conducted in fall 2017 and early 2018. This entry was posted on Thursday, October 4th, 2018 at 2:42 pm	and is filed under Departments, Fall 2018, Issue, News, News Around the School, Vanderbilt Nurse News. You can follow any responses to this entry through the RSS 2.0 feed. Both comments and pings are currently closed.